We offer several models of Tractor, Skid Steer Loader, And Truck Mounted Wire Winders for us rolling and unrolling barbed wire or electric fence wire. The wire winders mount on either your tractor's three point hitch or draw bar, or front bucket, allowing it to also mount on a skid steer loader. The tractor mounted wire winders are hydraulic drive; we also have a gas powered model mounted on a frame that you can put in your pickup bed or trailer. We also have a unique model that mounts to the side or your pickup box, and is powered by attaching the drive mechanism to your truck's rear wheel, and wire is either picked up or layed down by just driving the vehicle. The units are fast and easy to use; the hydraulic models can be mounted and operated by one person. To wind, park the vehicle, tie a weight on the far end of the wire to prevent jumping (a short length of chain works well) and pull the wire towards you. When the reel is full, tie the roll with 4 retainer wires held by pre-drilled holes in the reel edges. The reel splits easily by spinning the nut off the 1 inch shaft, and the roll lifts away without binding. To unwind wire, tie the wire to a post, set vehicle's hydraulic control lever to the "float" position and drive forward to unroll the roll. 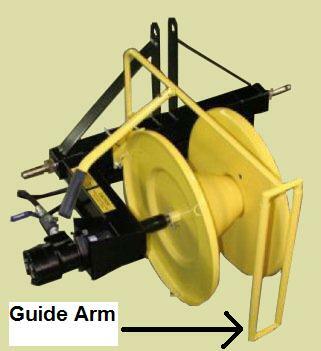 The wire winder can be used as a: wire winder; cable roller; and wire rope winder. The winder will roll up almost any kind of cable or wire including high tensile wire. These models have a ball valve type control valve to provide variable speed control. The smooth operating valve allows you to easily select any rotational speed from fast down to creep, as well as completely stopped. The winder's hydraulic motor provides ample power for hard jobs like pulling barbed wire through tall grass; even heavy underbrush. Always regulate rotation speed from the hydraulics on the tractor, and always plug the valve hose into the power side of the hydraulics. 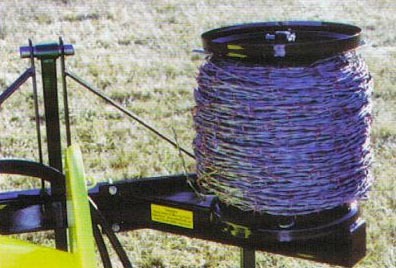 The wire winders have a large capacity and will roll barbed or smooth wire, as well as light cable. The reel will hold 1/2 mile of barbed wire or 1 mile of smooth wire. (If you need a larger reel, scroll down on this page and look at the Magnum series rollers). 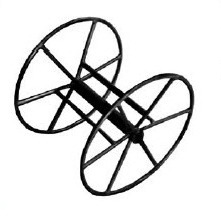 The winders use 20 inch diameter reels constructed of 12 gauge steel making them virtually indestructable; reels are mounted on a heavy duty frame constructed of 11 gauge, 3 inch square tubing. Long life, replaceable, moly-impregnated poly bushings prevent wear to steel parts. It is easy to unwind the roll after it has been wound on the roller; put the spool of wire back on the roller and put your tractor's hydraulic lever in the "float" position and drive your tractor or vehicle forward. The circulation of hydraulic fluid through the motor provides resistance to keep the reel from over-spinning. If you are using a skid steer loader without a hydraulic "float" position, you can connect the winder's two hose ends together (using your own adapter) for the same effect. 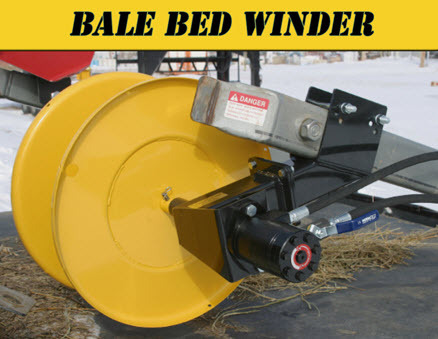 The winders can be purchased with several types of mounts including: a 3/8" thick steel plate (the Universal Mount); Bale Bed Mount; and tractor three point mount (categories 1, 2, and 3). Category 1 hitches are mounted on tractors up to 65 hp; category 2 hitches are on tractors from 65 hp to 125 hp; and category 3 narrow is on tractors from 125 hp to 200 hp. Please note: A single strand of 2.0 Premium grade Barbed Wire with barbs 4 inches apart, that is 1320 ft. long (1/4 mile) weighs 80 lbs. So weight of wire on a single cone unit would be 160 lbs. (holds up to 1/2 mile) and 320 lbs. 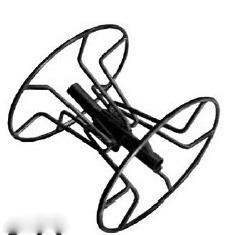 for the Magnum series, holds up to 1 mile of barbed wire. Model for category 2 three point hitches is standard model and usually in stock. Models available as listed below for Category 1 and 3, three point hitches are special order models; please allow 1 week before shipment on those models. Model PTHWW-2: Universal hydraulic wire winder for category 2, three point hitches, with cone splitting reel, (this model normally in stock) - Click on the link below for current price and/or to order. Model PTHWW-1: Universal hydraulic wire winder for category 1, three point hitches, with cone splitting reel, (please allow 3-5 days before shipment on category 1 models) - Click on the link below for current price and/or to order. Model PTHWW-3: Universal hydraulic wire winder for category 3, three point hitches, unit has cone splitting style reel - Click on the link below for current price and/or to order. Model PTSSWW: Universal Hydraulic Wire winder complete, mounted on the universal mount shown above instead of three point mount, unit is fully assembled. Universal mounting plate allows you to mount the unit on loader buckets and other surfaces, winder has cone splitting reel - Click on the link below for current price and/or to order. 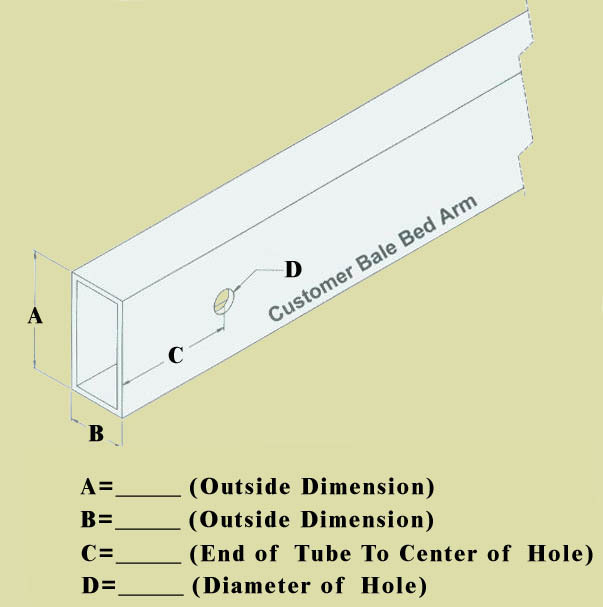 When ordering, the order page has a drop down menu with a list of several standard tubing sizes for the mounting sleeve on the winder. Please choose the required size; if none of the tubing sizes shown is the same as your bale arm, then select the closest size and give us the exact dimensions. The information can be entered in the comments box on our order form. Model PTBBWW: Universal Hydraulic Wire winder complete, for mounting on bale beds, unit is fully assembled, has single cone splitting reel - Click on the link below for current price and/or to order. Model PTWG123: Optional guide arm to roll wire evenly on the single cone wire rollers PTHWW and PTBBWW series winders - Click on the link below for current price and/or to order. Above price is for guide arm purchased separately, if ordering with a reel, click this option in the drop down menu for better pricing. 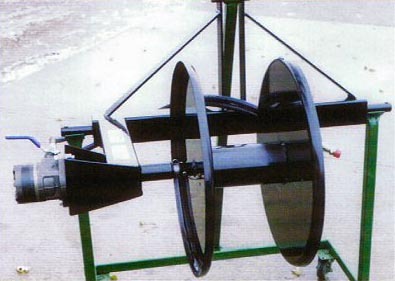 Photo shows the solid reels mounted on a winder. You are only purchasing the solid reel as an accessory to the hydraulic winder. The solid reels are an easy way to hold the wire, order several and wind each strand on a reel and store the wire on the reel ready to be pulled. Model PT-SO-4: Solid replacement reel (reel only, photo shows reel mounted on winder frame), solid reel has 4 inch diameter core tube, for Standard PT series winders only (not Magnum), this reel has a 4 inch diameter core and should be used for rolling standard strength wire only (for high tensile strength wire order the 8 inch diameter core below) - Click on the link below for current price and/or to order. Model PT-SO-8: Solid replacement reel (reel only), solid reel has 8 inch diameter core tube, use for rolling high tensile strength wire, reel is for Standard PT series winders on this page (not Magnum series) - Click on the link below for current price and/or to order. Model PTOA: Optional arm assembly including reel, is designed for unrolling new rolls of wire, for use on the model PTHWW-2 model only (three point hitch mount category 2 model only) , has removeable reel that splits in half to let you unload wire, can be easily adapted to ATVs, pickups, etc. - Click on the link below for current price and/or to order. 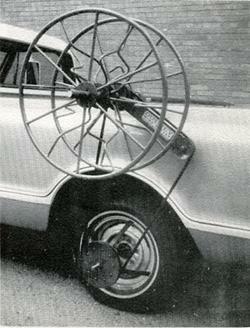 The Category 2 Hitch Model is Standard And Usually In Stock - Models Listed For Category 3 Hitches Is Special Order. Please allow 1 week before shipment on special order models. 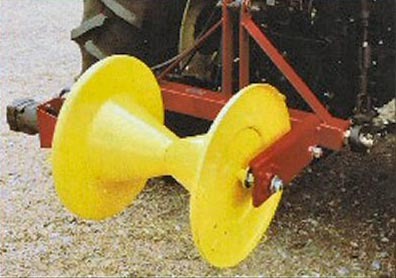 Model PTMSWW-2: Magnum series double cone wire winder, for 1 to 4 strands at a time, hydraulic powered, requires auxilliary hydraulic outlet on your tractor to plug in 2 hoses, mounts on category 2 three point hitches - Click on the link below for current price and/or to order. 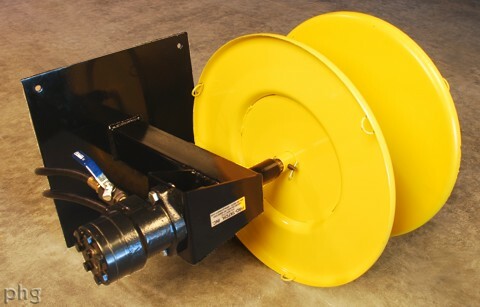 Model PTMSWW-3: Magnum series double cone wire winder, for 1 to 4 strands at a time, hydraulic powered, requires auxilliary hydraulic outlet on your tractor to plug in 2 hoses, mounts on category 3 three point hitches - Click on the link below for current price and/or to order. 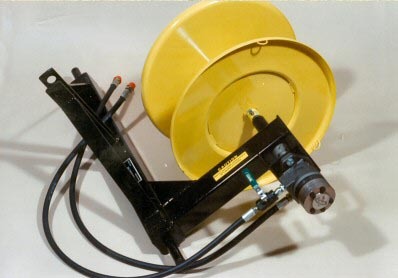 Model PTSSMSWW-U: Magnum series double cone wire winder, for 1 to 4 strands at a time, hydraulic powered, requires auxilliary hydraulic outlet on your tractor to plug in 2 hoses, has a universal square plate mount that can be bolted/welded/clamped to most flat surfaces including buckets on skid loaders and tractor loaders - Click on the link below for current price and/or to order. Because of the physical size of the reel, this unit has to ship by truck. 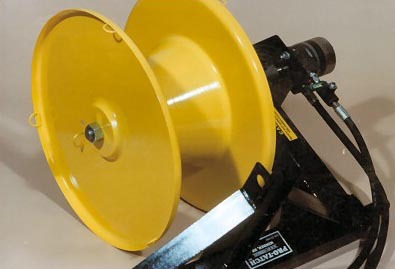 Model DD-WR: Truck powered wire roller, mounts on any pick-up, please specify make and model of truck, size of box, and wheel size - Click on the link below for current price and/or to order. 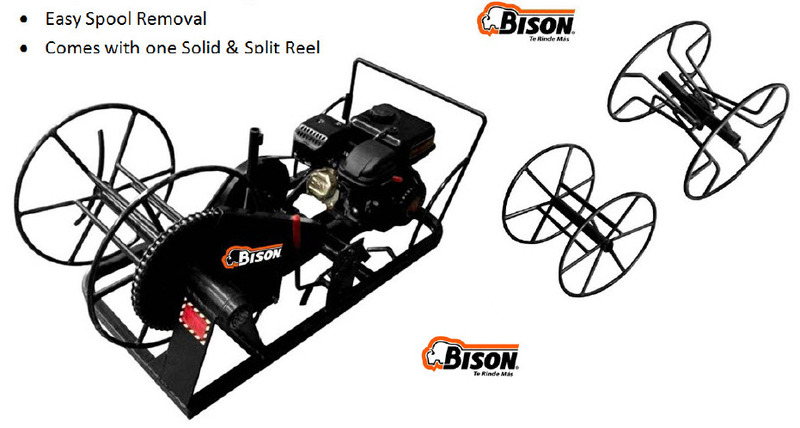 Model BIEC01010000A: Engine powered wire roller, includes both a solid and a split spool, powered by 6.5 hp OHV engine, weighs 143 lbs. and ships by truck - Click on the link below for current price and/or to order. Unit also available with a 6.5 hp, GX200 series Honda Engine, click the order form button below and see this option in the drop down menu on the page. If ordering extra spools with the winder order them in the drop down menu on the order page; if ordering them separately without a winder, then order them below. Part No. BIEC99010000A: Extra/replacement split spool for engine powered wire roller, roller halves separate so wire can be removed, wt. is 17 lbs. - Click on the link below for current price and/or to order. Part No. BIEC99020000A: Extra/replacement solid spool for engine powered wire roller, roller is one piece solid, the only way to remove wire from spool is to unwind it, wt. is 17 lbs. - Click on the link below for current price and/or to order.